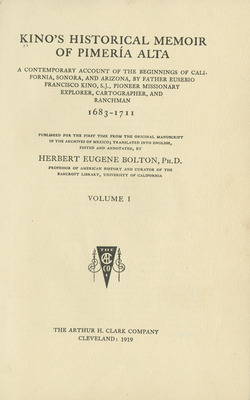 Bolton, Herbert Eugene, “Kino's Historical Memoir of Pimeria Alta: A Contemporary Account of the Beginnings of California, Sonora, and Arizona, by Father Eusebio Francisco Kino, S.J., Pioneer Missionary Explorer, Cartographer, and Ranchman, 1683-1711 ,” Arizona 100: Essential Books for the Centennial, accessed April 21, 2019, http://speccoll.library.arizona.edu/online-exhibits-dynamic/az100/items/show/220. 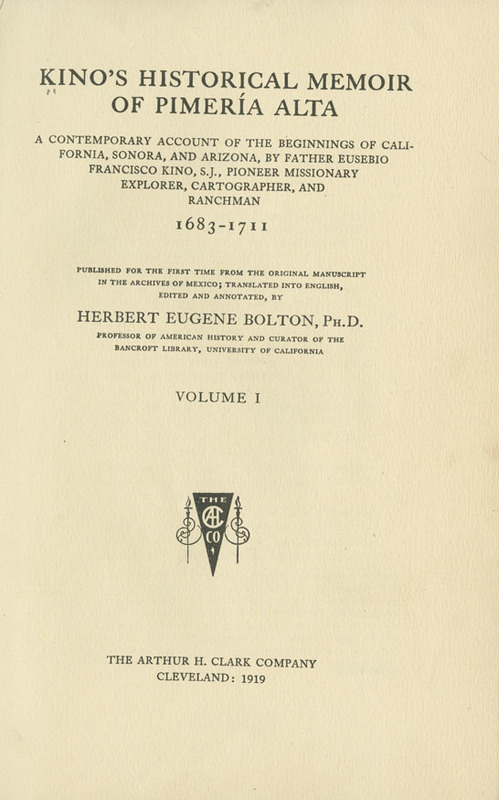 Because of his popularity today it is difficult to imagine that Jesuit padre Kino’s main writings were misplaced for nearly 150 years in a Mexico City archives until dusted off by historian Bolton in 1907. Between 1687 and 1711, he made more than fifty extended trips in the Southwest, mapped villages and mountains for the first time, and established missions and trails. 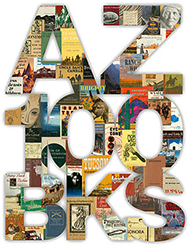 He explored southern Arizona by foot and saddle in epic trips. He also was Arizona’s first rancher, bringing herds of cattle, horses, and other livestock to missions where they multiplied. Cleveland : The Arthur H. Clark Company, 1919. 2 v. fronts., maps (1 fold.) plan, facsim. 25 cm.